Being a parent, my intense interest in scorpions began one evening when we were visiting relatives in Ahwatukee who lived next to a mountain. We called the place "The Scorpion House". One evening, a family indoor putting contest ended up with a golf ball rolling under a chair. As I was about to reach under the chair for the ball, I noticed something in the dark shadow. Was it a rubber band? Was it a scorpion? Was I willing to take a chance? NO. YES. NO. My young daughter was scared of the scorpion. She made me promise that I would do my best to make sure it did not get her. I moved the chair and the scorpion came sprinting towards me trying to get out of the light. Fortunately, I was wearing shoes and the scorpion was stepped on and soon was quickly blended into the fibers of the carpet. We now own "The Scorpion House". Despite sealing the house and paying for monthly exterminator visits, the very fact of living next to a mountain meant that scorpions had easy access to our yard and ultimately might find their way inside. Then, it dawned on me... Dead scorpions would not be able to get inside my house. Dead scorpions would not be able to reproduce. What is the most effective way to find and kill scorpions? After months of research, and many different investments in tools, black lights, goggles, gloves, etc., I soon learned that with a very powerful black light, UV safety goggles, and the correct grabber, with practice I could easily hunt, grab, and kill scorpions. Eventually, in only a few minutes, I could cover more than a half acre and quickly eliminate any scorpions that might migrate their way towards the house. Soon, friends and neighbors asked me to help them protect their families and pets. Today, as more and more people need help, I try to make time for them all. "I will do my best to make sure that scorpions don't get you or your family." 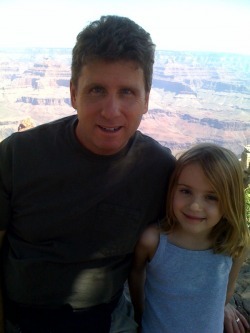 Thirty years ago, I decided to make Arizona my home. I loved this state then, and I still love it today; despite the heat, despite the growing population, and despite the scorpions. Back then, Arizona State University was not anywhere near as large, and it offered a nice boy from the Midwest a place to get away from home, watch girls, get an education, and watch more girls. After switching majors a few times, I graduated ASU with a BS in Broadcasting and continued this journey called life. Today, I am married, and a father, but I have always believed that every person should find time to give back to the community. So, as often as time permits, I try to voluteer my time, donate items I no longer need, and help people with their scorpion problems. Recently, I coached (and attempted to pitch) in the Ahwatukee YMCA coach/pitch league. 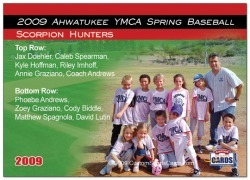 Ironically, the kids voted on a team name and were known as "The Scorpion Hunters". There are children all over Arizona who have limited access to sports and recreation. Park district programs have been reduced everywhere due to budgets. Schools are offering less and less Physcial Education classes. And almost every season, in almost every sport, the YMCA needs quality adults to volunteer as coaches. If you know of any person who can spare a few hours a week for only a month or two, it will mean so much to so many children here in the Phoenix area. Please contact your nearest YMCA and ask for the Sports Director.